I have a special interest in amusement parks, particularly ones that no longer exist or those that feature vintage rides. 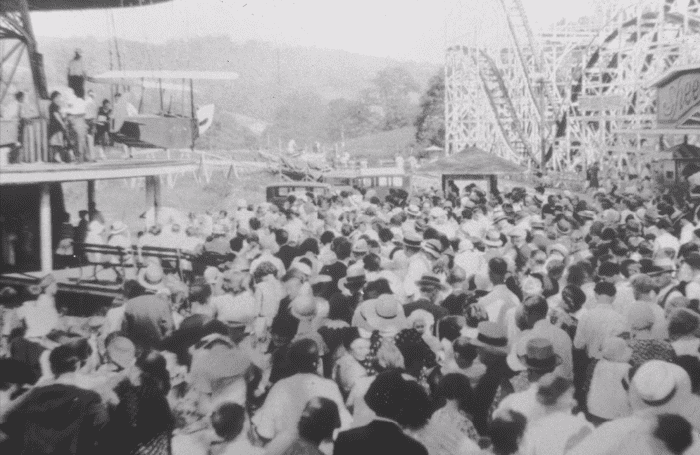 From the late 19th century until the 1950s, there were almost two dozen amusement parks of varying sizes located throughout the Pittsburgh area. One of these was the Burke Glen Park in Monroeville. Located alongside Old William Penn Highway near Elliott Road (near present-day Levin Furniture) was a 141 acre parcel of land. This land had been in the Thompson family for over 100 years before it was sold to the Burke brothers in 1925. The four brothers, who were plumbers by trade, opened a small amusement park called Burke Glen along one side of the highway in 1926. 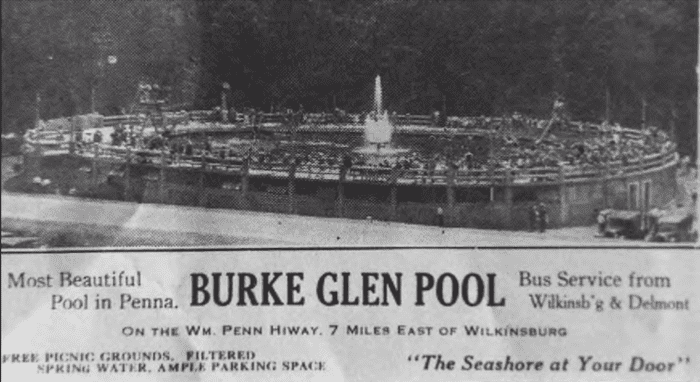 Unlike other local parks such as Oakford Park, Kennywood, and West View Park, Burke Glen was not a trolley park. 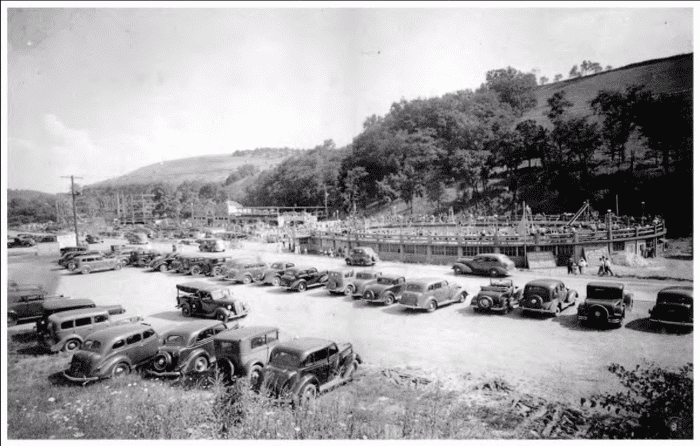 Instead, this amusement park catered to those families who had automobiles. Monroeville was considered an area where families living in the city could get away from all of the smog. Plus, Burke Glen boasted plenty of free parking as well as bus service from Wilkinsburg and Delmont. It had a roller coaster. Vintage roller coasters are my favorite and I’m not sure it could be considered an amusement park without one. Burke Glen’s roller coaster was called the Speed Hound and it dominated one side of the park. Due to the fact that Burke Glen was built a little later in the amusement park boom, the Speed House was most not likely a figure-eight side friction roller coaster, but instead was the kind with the wheels underneath the track as well. 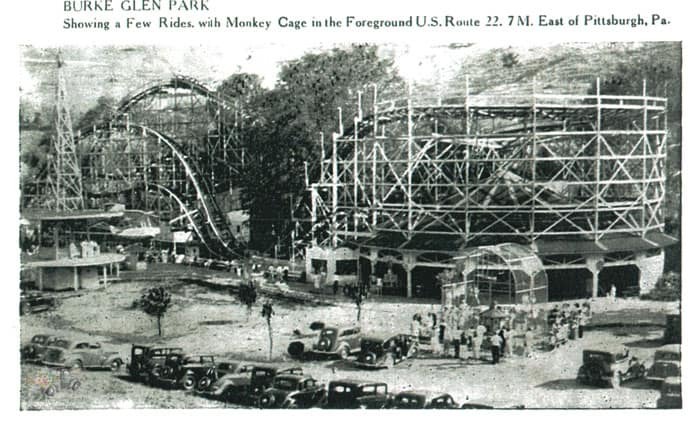 In addition to the Speed Hound, Burke Glen also featured a large swimming pool, picnic groves, an arcade, dance hall, and miniature golf course in addition to rides such as a circle swing, carousel, and smaller rides for young children. Like many of its competitors, the mid-1940s were tough for Burke Glen. Although it survived the Depression the park’s success with the automobile became strained during World War II gas rationing. The final blow was the construction of the new Route 22 in the 1940s which took land from the park. 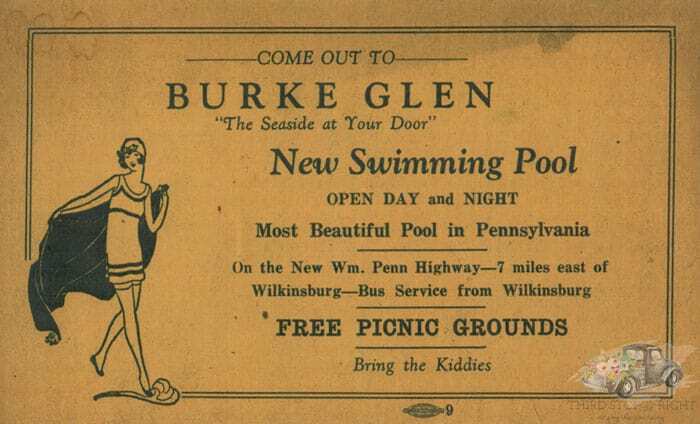 Like many other amusement parks of that time period, Burke Glen featured a very large public swimming pool which attracted both local teenagers as well as families with children. Even though by the 1970s all of Burke Glen’s rides were gone, the picnic stand, pool, and miniature golf were still a popular draw for locals. The park suffered through several unprofitable seasons and with little money for maintenance, the park closed for good in 1974. As with many of the area’s other defunct amusement parks, today nothing remains that would give a hint to the past. The area has been redeveloped, leaving Burke Glen just a memory.